This Christmas, why not ditch brightly coloured baubles and tinsel and opt for a rustic approach to your decorating scheme instead? 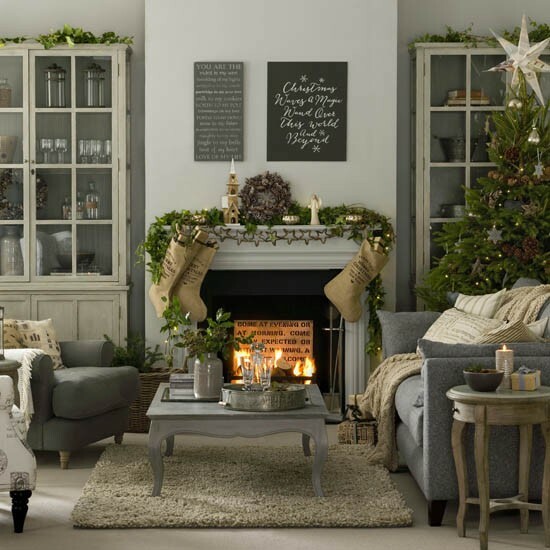 Traditional Christmas decorating schemes have timeless appeal, so your style and look will last for several years if you don’t have the time or cash to update your decorations every year. Make your fireplace the focal point by decking the mantel in festive foliage, and complete the look with a hessian stocking at each end. Replace the traditional overmantel mirror with a chalkboard panel where the family can write festive messages. When it comes to the tree, select a real fir and embellish it with natural pinecones and woodland decorations to complete your living room’s rustic look. 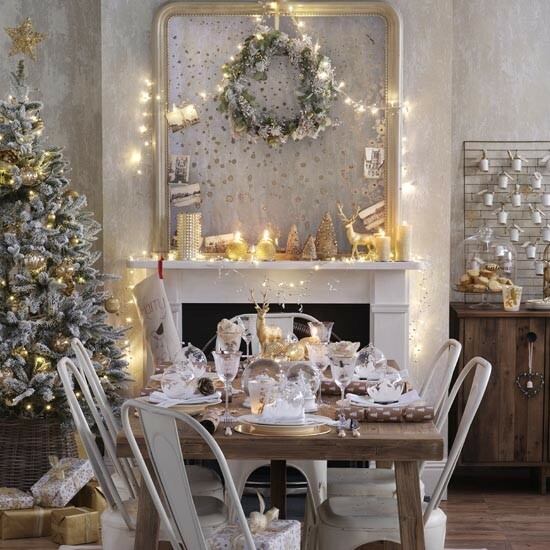 Cast a Christmas glow over your dining room with a shimmering old gold and cream colour scheme. If you have a neutral room to begin with, it’s an easy look to put together. Start with the dining table as your focal point, and dress it with gilt-trimmed china and glassware, old gold baubles, candle votives and luxe crackers. Make the mantelpiece sparkle with a grand overmantel mirror, strung with sparkling fairy lights that will shimmer in the reflection. Go for all-out glitz and glamour when it comes to decorating the dining table. Keep to just two or three key colours for a co-ordinated look, such as this arrangement in gold, white and crystal. Dress the table with a fabric runner and a charger plate underneath each place setting, layered with matching napkins, candle votives and glassware. 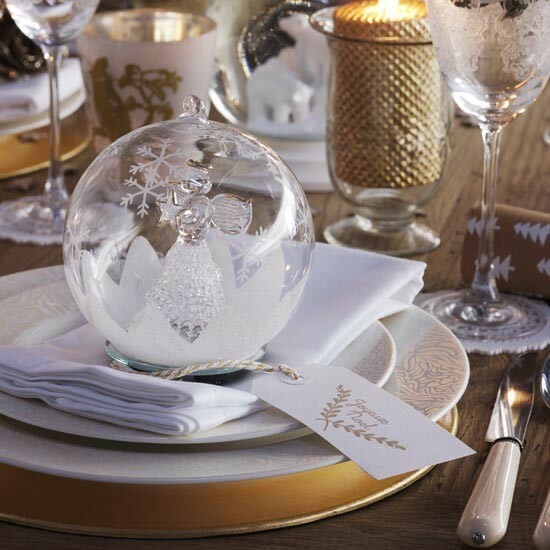 As a special finishing touch, put a Christmas bauble with a name tag at each place setting so guests can take home a memento afterwards. 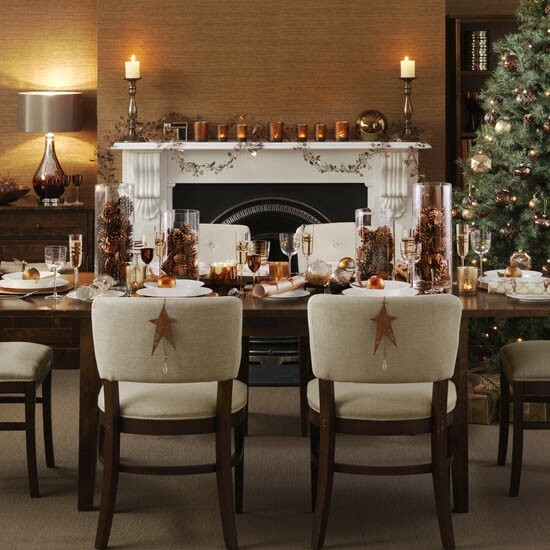 Embrace the current copper trend this Christmas by using metal accents to add a luxurious look to neutral décor. Line the mantel with a row of mini votives and candlesticks to cast a warming glow across the room. Continue the metallic theme onto the dining room table with copper charger plates and baubles, luxe crackers and glassware. Fill a row of tall vases with rust-coloured pine cones as a striking table centrepiece.